Derek Bell launched Mosaic Trust, LLC (now known as Mosaic Strategy Group) in 2005 during which time he has had the privilege of serving on Bob Buford’s, “Bob, Inc.” team. Bob, Inc. is a four-man team that advises Bob Buford on where and how to invest his philanthropic activities. Prior to Mosaic, Derek served as the Director of Marketing for Integrity Publishers where he managed the marketing for numerous New York Times Bestsellers including Max Lucado, Ravi Zacharias, Henry Cloud and John Towsend, Pat Roberston, Bob Buford, Frank Peretti, Brennan Manning, and others. At LifeWay Christian Resources (a $500 million dollar organization), Derek’s tenure included leadership in channel management and corporate strategic planning with the direct to church division, retail, trade publishing, international, and Internet divisions. While at LifeWay, Derek completed his MBA at Belmont University and was inducted into the Sigma Beta Delta honor society. He later returned to Belmont as an adjunct professor of marketing and management. While consulting with Mosaic, Derek also served as a pastor on staff at Fellowship Bible Church, a 6,000 member church in Brentwood, Tennessee. Derek currently serves as the volunteer chairman of the board directors of Both Hands, an organization that raises funds for families to adopt children while serving a local widow. To date we have helped over 668 children land in homes forever while serving over 787 widows in 42 states–while raising $6.8 million dollars for families adopting. Derek, his wife Jennifer, and their three children Macy, Parker and Grayson live in Brentwood, Tennessee. 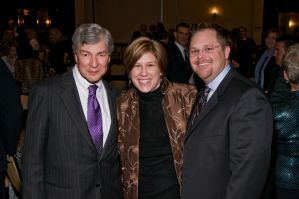 Jennifer & Derek with Bob Buford.